Since reading the stories of Jack London as a kid I had dreamt about visiting this Arctic land and the amazingly vast landscape inhabited by tough and hardy people and amazing wild animals. Since years I was feeling the urge to visit this place and after Patagonia in 2016 I had set my course to come here as soon as I was ready. 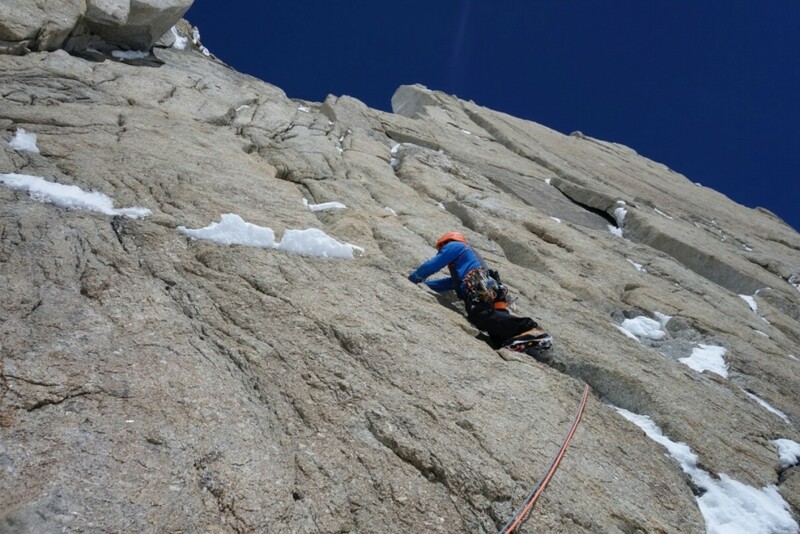 My passion is Alpinism and I love to combine outdoor adventures with climbing. But I needed something that really challenged me and motivated me to improve. 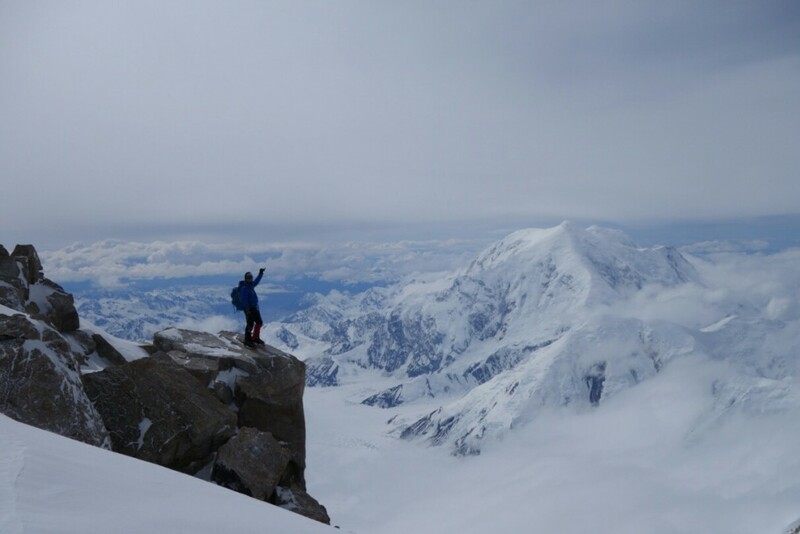 I had read Mark Twight Kiss or Kill a couple of years back and the story of his ascent with House and Backes of the “Czech Direct” on the South Face of Denali (6190m) had really inspired me by the audacity and the commitment. This route was opened in 1984 by three Czechs Krizo, Korl, Adam, over 11 days. I great ascent by strong east europeans. 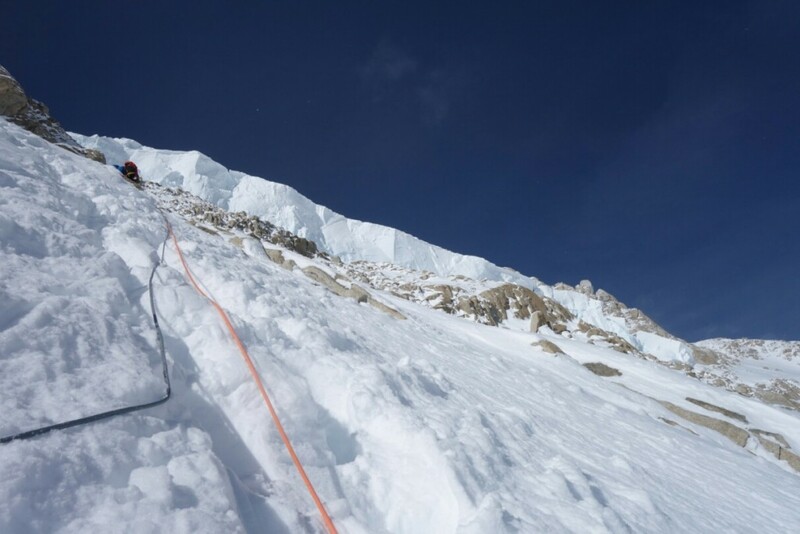 As I looked at the pictures of the wall and the climbing I really began to feel it was possible for me, If I managed to get strong enough, disciplined enough on the acclimatization, and find the right partner I would be able to do it. The Czech direct is considered the hardest route up the highest mountain in the north American continent, it is 2800m of elevation gain and more than 3000 m of climbing graded Alaska 6 W6 M6 A2 ED+. Only 7 teams had repeated the route since 1986 and all were aces. I felt I was being very ambitious, but you have to be sometimes or else you are not living to the fullest. The time passed and my experiences in the Swedish arctic, Karakorum, Patagonia and the Alps gave me the confidence that I was able to climb hard for several days on end, I could resist intense cold without any damage and that I was able to commit all myself to a climb and succeed. 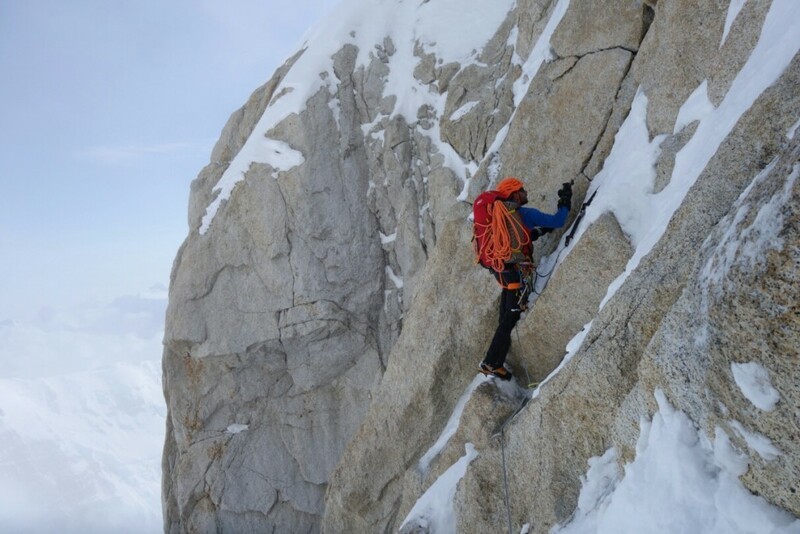 Also my climbing partnership with Luca Moroni a good friend from Varese was developing well, we were climbing some really good and long routes in the Alps such as Divine Providance and he was really motivated to get his hands on something harder outside of his home turf. 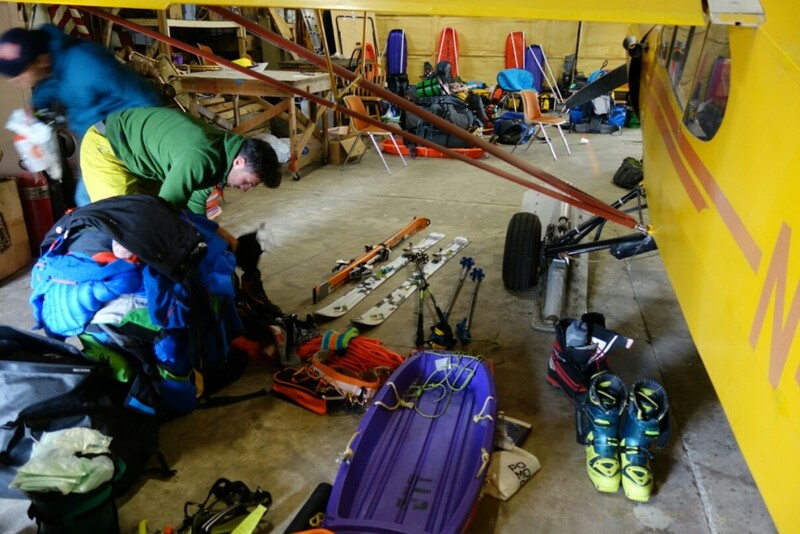 Perfect, after another successful trip in Patagonia on Cerro Murallon, I was ready for Alaska. 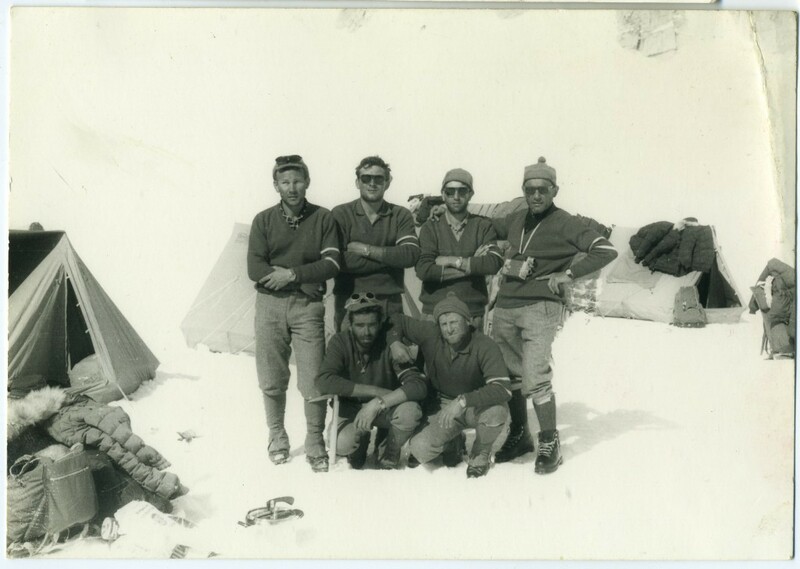 As soon as I returned home I immediately began the preparations getting the funding and support from my group the RAGNI DI LECCO whom had opened the Cassin Ridge in 1961 or better the via “Citta di Lecco” which is the ridge line immediately on the left of the Czech direct. I got to the meet the climbers of the first ascent like Luigi Airoldi and Romano Perego whom motivated me and encouraged me to take on this ascent. They said “If you go you will do it” and “if you are prepared you won’t fear anything” and other stuff like “I lost three toes on it” and “it was the coldest experience of my life”. We booked flights for the 29th of may and decided to dedicate a month to it. 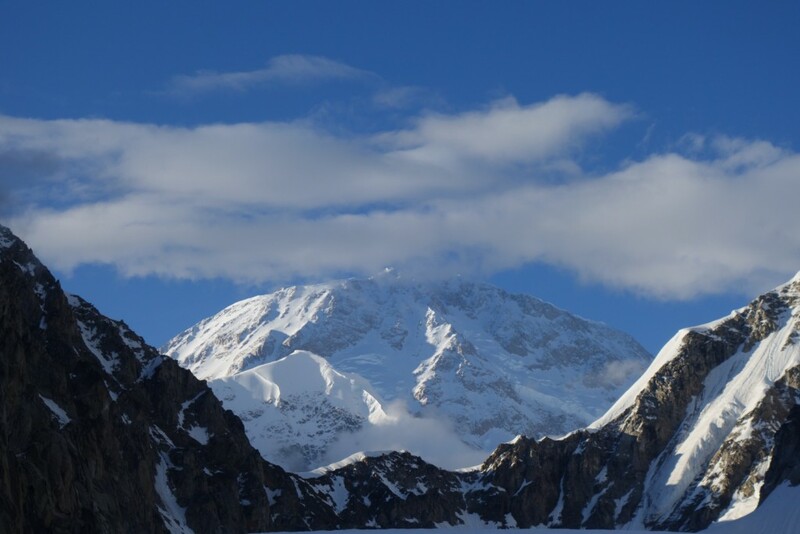 The first 10 days would be spend acclimatizing and the rest to climb the route. We were planning not more than 5 days on the route. Me and Luca arrived in Anchorage and bought all the necessary supplies, packed our backs and after a couple of beers with a Eskimo bush pilot whom emotionally told us about the fact that he had lost already three pilot friends in the first part of the year we headed to Talkeetna to meet with our pilot to fly in on Denali. We had booked with Sheldon Air Service, operated by the daughter and family of the same Don Sheldon that flew the Ragni di Lecco and Riccardo Cassin in 1961. His airplane was still in the hangar and we were sleeping next to it. I could feel the history of my group very much alive. 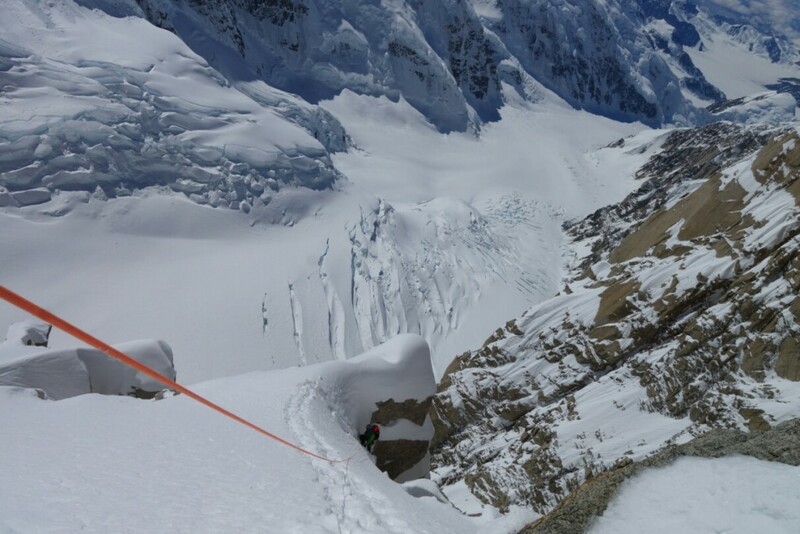 We had a meeting with NP Ranger Mark Westman whom had climbed the route with Jessy Huey and gave us some beta about the approach and showed us some pictures about his ascent. Two things worried me the most: the approach and a 30 hour day to get through the main difficulties. Mark super friendly and enthusiast psyched us up even though I do not think he believed we had a chance as “guys on their first experience in Alaska and want to do Czech direct” he also told us that there were other 4 teams that wanted to climb the Czech… 2 girls, a Piolet d’or team, 2 strong Brits and 2 Finns and us. 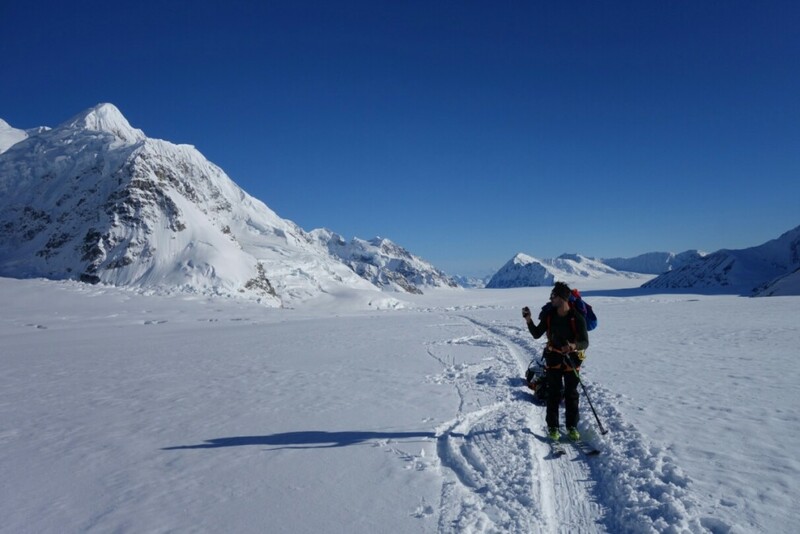 After a very scenic flight we landed on the Kahiltna glacier and started to haul our big sleds up the west buttress route, 70kg of gear and food each felt very heavy and it took us 5 days to reach 14k camp (4300m) I was feeling well and the glorious weather was making it almost enjoyable. Luca was also feeling good and dragging 2 sleds instead of one. 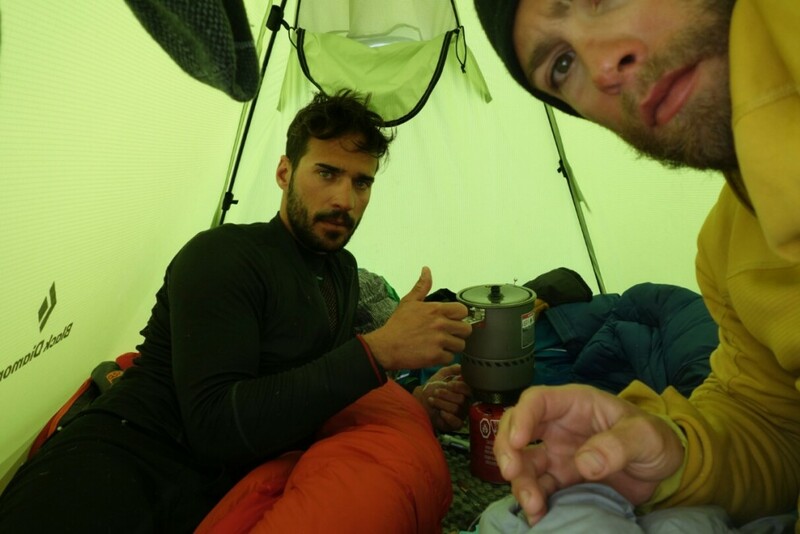 We arrived the 4th of june at 14k camp and placed our little home and dug in. The weather continued to be good for the rest of the week with no wind and almost warm temperatures. I really thought all the other teams would be climbing the Czech in that window, but I found them at 14k doing Yoga. Seemed like a waste of time. 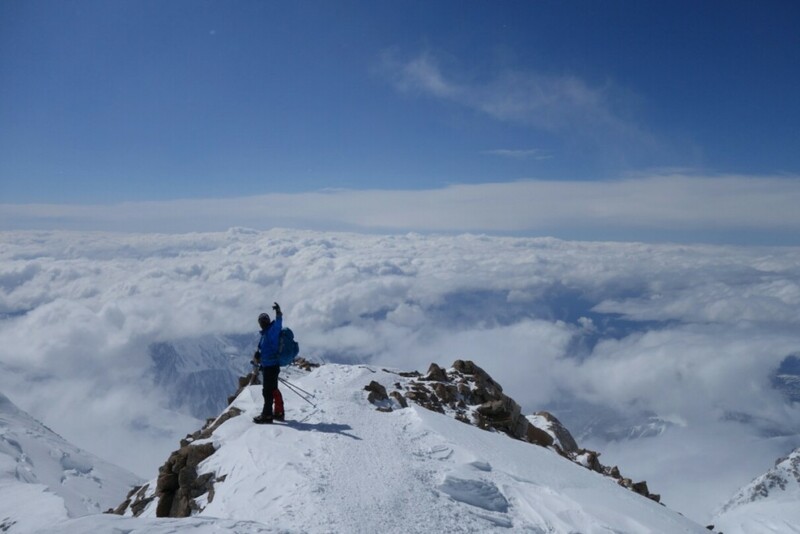 Me and Luca went up the west buttress route to 5000m then to 5500m rested a day and went for a summit push. From 14k it is about 2000m of elevation gain. However the weather changed and we had to wait another week before we could finish acclimatization. At 5800 Luca had really cold feet and had to retreat. I continued to the summit. It was bitterly cold and about -40°c. I was feeling very well and not cold at all. My confidence on our success was getting bigger. 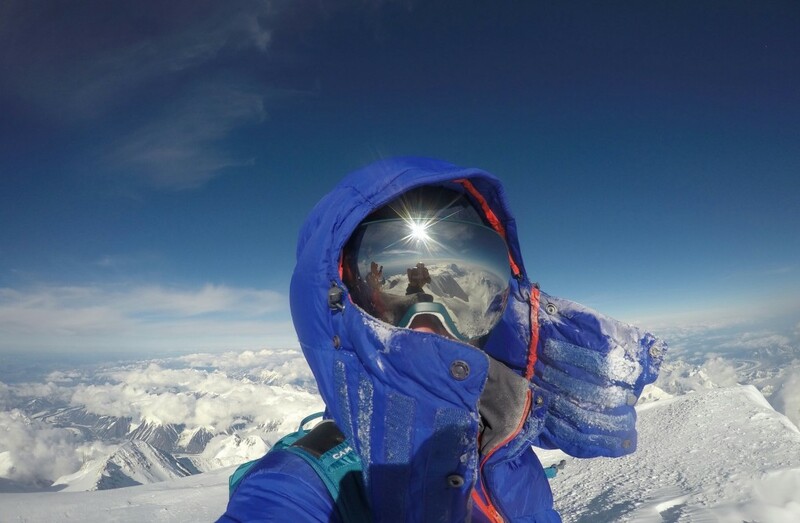 Luca came down but after a day of rest he went back up in record time stopping just short of the summit because “I only want to reach the summit through the Czech” demonstrating serious commitment and motivation. After that the weather closed and we began our wait for a decent weather window of about 4 days that would allow us to climb the route. The weather was extremely variable and very cold. The average temperature was -20°c and it was snowing continuously but we were confident we would get our chance. In the meantime the other teams had attempted the route at the tail of the good weather window retreating less than half way up the route. The Piolet d’or team did not even get on it and the Finnish team was stopped by pneumonia. We were the only ones left with another 12 days at our disposal. The 21st our good friend Matteo della Bordella, now a real expert of weather forecasting predicted a high pressure from the 19th with one day of less than good the 20th and then good for at least 4 days. It was our chance. On Midnight of Monday we looked at each other and decided to go for it. The descent on the Wickwire ramp was everything you should not do in the mountains. Waist deep snow, wind slabs , seracs over our heads waiting to rumble down on us and crevasses all over the place. After 5 hours beating trail we reached the end of the ramp, Colin Haley’s topo of the descent really helped us to navigate this terrain. We intended to climb the notch but it looked really dry so decided to climb up to the right of the Japanese colouir and see. Again in in waist deep snow we reached a rock on the ridge and all of a sudden a piton and a carabiner from the Ragni di Lecco showed us that they had passed through this point. On the other side was a colouir going down directly to the north east fork and the base of the south face. 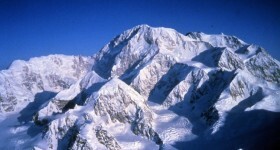 It was the original start of the Cassin Ridge. We descended the gully and two hours later reached the base of the wall and at 8 in the morning placed our little BD first light tent and rested in the tent. What a nasty approach. We slept through the day and below this monster we were worried we had taken a too big of a challenge. 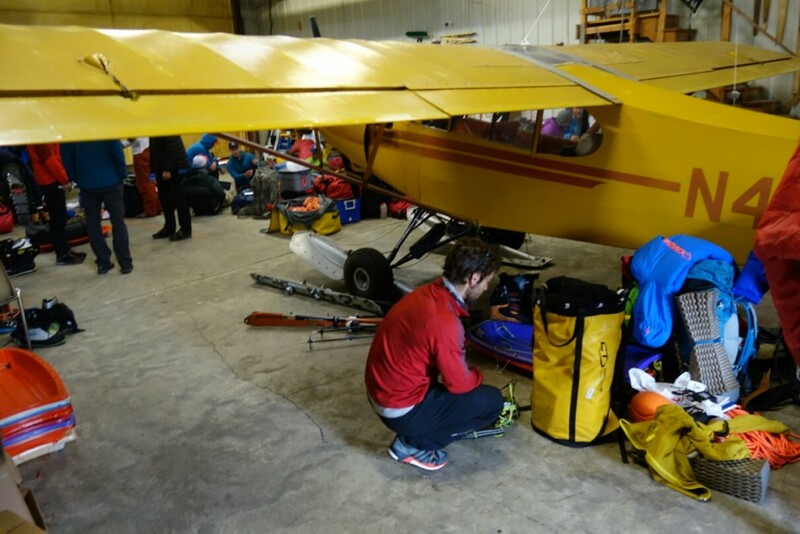 Getting back to 14k camp would be helland we felt very committed. Again we began climbing as a soon as the wall got in the shade at midnight. 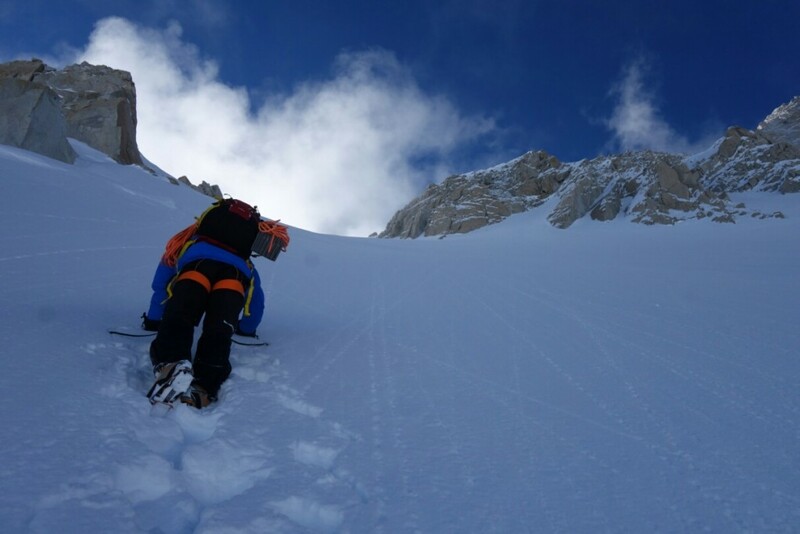 We quickly understood that no hard snow would help us progress quickly and we had to fight through deep snow. 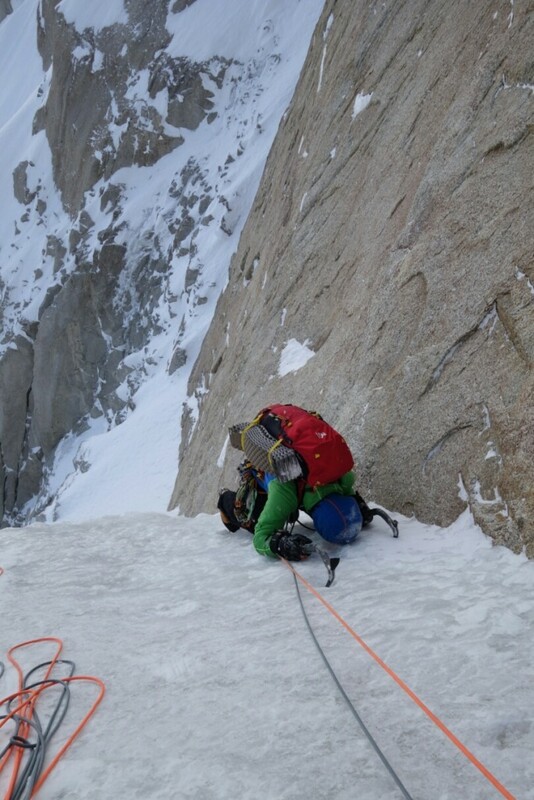 The fun part began with a very long traverse on a thin crust to get to the first W6 pitch. I went for the W6 pitch but it was covered with snow and a crust of rotten ice, it took a while to get through it and climbing it with a heavy pack did not help. 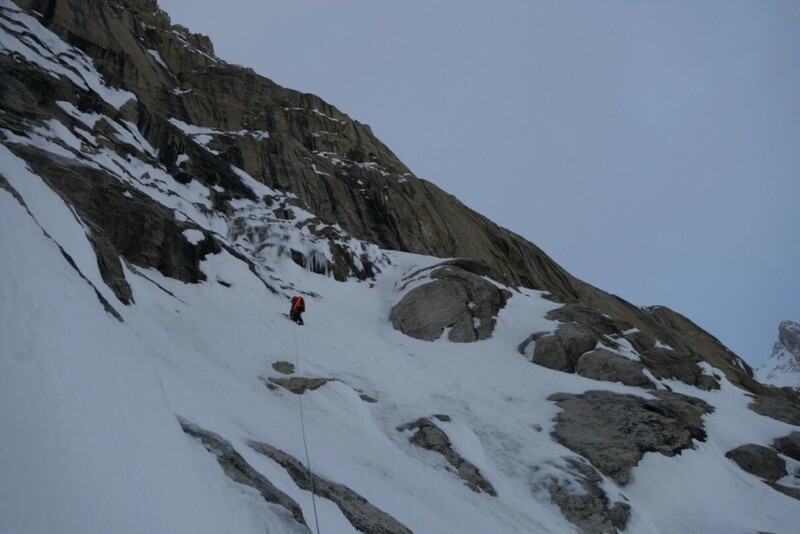 An hour later Luca reached the belay and we continued, the climbing did not ease off, with sustained M5 pitches and some steep inconsistent snow. We reached the first serac and snowfield where we intended to bivy at 10 in the morning after having climbed for more than 10 hours. We placed our tent below the bergschrund hopefully protected from anything falling from above. The weather changed as predicted and it started to snow. We felt tired and decided to rest before the “longest day”. It cleared in the morning again as predicted by Matteo. And at 6am we continued our movement upwards. As we began to climb every 60 meters appeared a nice BD ultralight camalot clearly signs of a hasty retreat from the wall. With them we integrated our rack. The terrain was now much steeper and sustained M5-M6 pitches with bad protection led us to the ramp. The terrain was very impressing with a gigantic blank wall just above our heads and the safety of the ground far below. Luca masterfully led his block taking me to the base of the ramp, which was now pouring spindrift over us. We had seen this scene in Houseman and Bullock’s video on their ascent and we were repeating their quotes: “big spindrift nick!” “this is amazing!”. 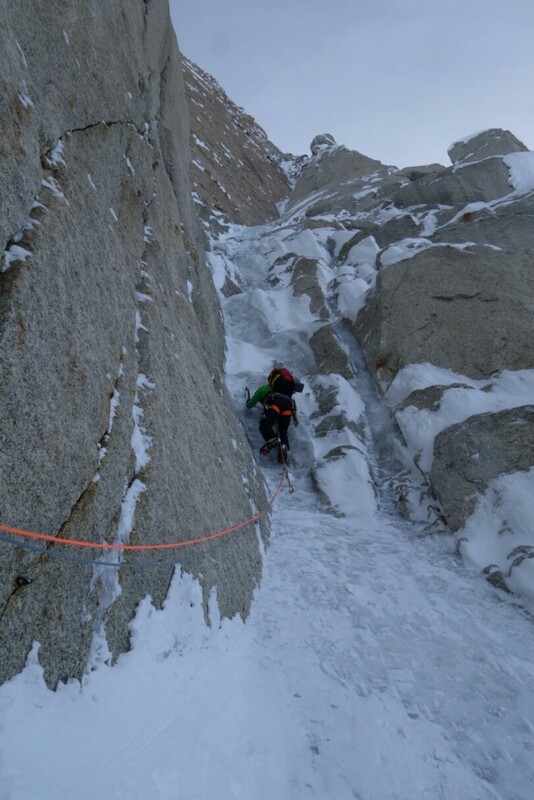 Nonetheless, I continued up the ramp on some great ice climbing pitches, especially the overhanging W6 corner. A last mixed m6+ pitch led to the rock wall with the aid section. I relaxed for a while and belayed Luca on it took us another hour to get through it I jumared with the heavy backpacks. 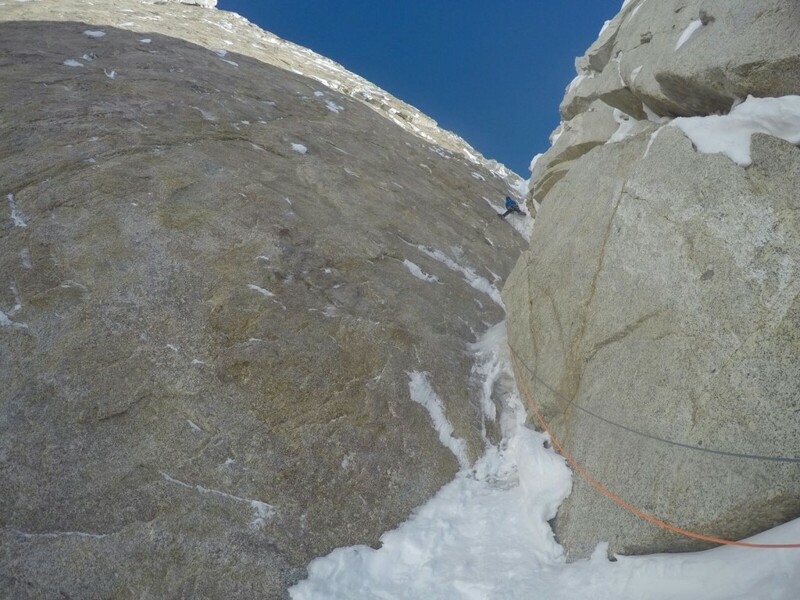 Luca set out on a traverse to the left on very poor and snow covered rock that required a lot of swearing to clean. 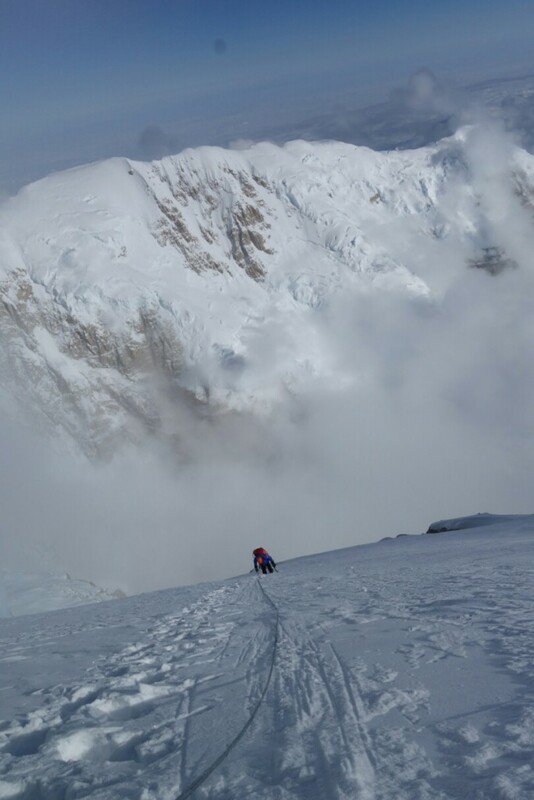 I followed and we reached a large 60deg snowfield to get to big Bertha the huge serac that marks our mid point on the wall. 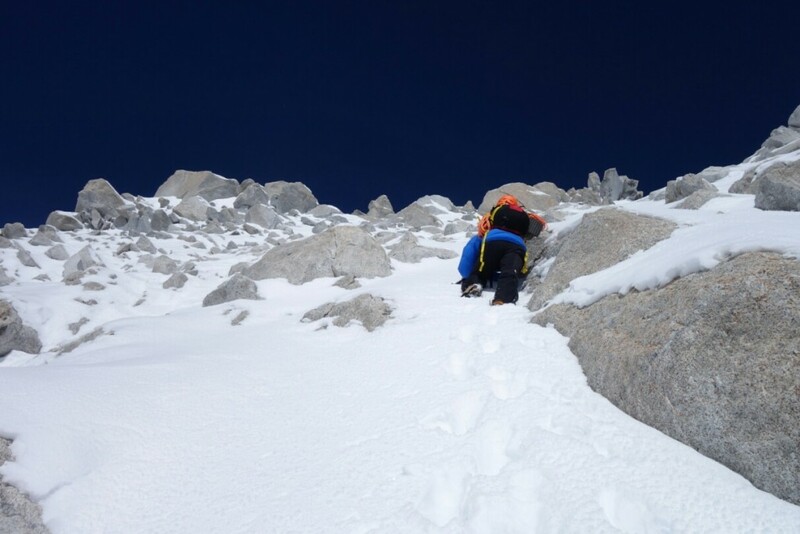 We continued through deep snow reaching the last rock wall after 22 hours of climbing. At that point unexpectedly Luca sat down and said he was completely exhausted and could not move any further and do anything and was terribly cold. 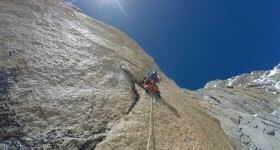 We were exhausted and I could not see any bivy spot at hand, getting over the last rock wall seemed too hard. We had to stop. Luca we his last flinch of energy saw a point were we could bivy but I claimed it was too icy and slopy to pitch our tent. Nonetheless I downclimbed and took a look. It was possible to dig a platform for the tent. We were saved! I shouted to Luca to continue brewing something warm as it would give him some energy back. I placed the tent and we settled in our sleeping bags after forcing down some warm tea and food. The next morning we realized where we were, next to big bertha on a very small outcrop on an endless slope the abyss below us. Luca had recovered his strength and we rested in the sun. At 4pm we set out again, we had already packed ropes and gear away but as we reached the rock wall that seemed very easy we realized it was not. It took us 2 and a half hours to get through these last M5 pitches and onto the last snowfield. 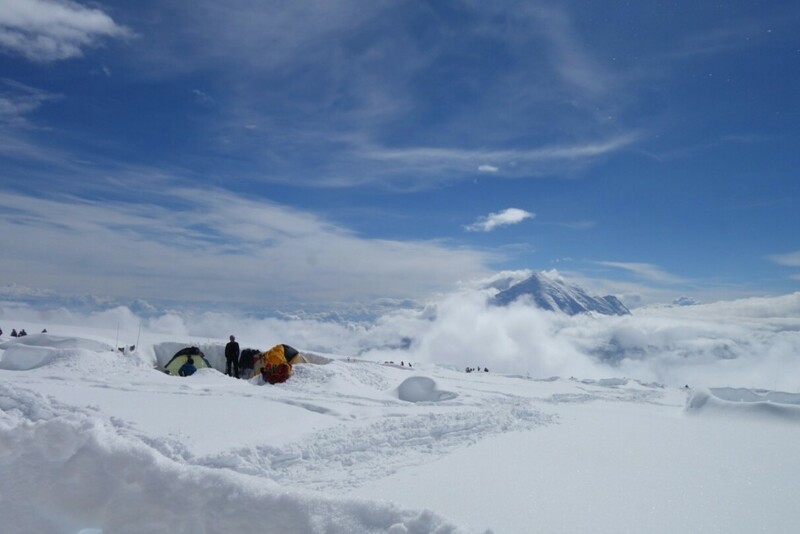 We were now at 4500m and at we had passed the point of no return. The difficulties eased and we knew it was easy terrain all the way to the top. However the snow was knee deep and breaking trail at altitude and after so many hours of climbing would be difficult and exhausting. We broke trail 100m each until we reached the Cassin ridge in the afternoon, we had been on the go for at least 5 hours and continued after a brew on the ridge line. We almost thought we could reach the summit that day. After another 6 hours breaking trail we were still 800m below the summit at 5400m. The terrain was easy but we were exhausted and we were unroped any mistakAs Luca walked unroped I heard two very loud Gun Shot noises coming from beneath us. It woke us up from our trance, what was it? A Cornice? A Wind Slab? We continued but after another 200m the snow got even deeper and we decided to stop for another bivy. At 5600m we started to dig a platform and Luca found an old red woolen sock in the ice. Perhaps from the Ragni? We had a very cold night, inside the sleeping my watch measured 10°c. Too cold to sleep so we shivered away the night. In the morning the weather had changed just as forecasted. We continued in deep powdery snow in no visibility. I thought about the Giri-Giri boys following the tracks of their friends until these disappeared as did they friends. e could easily mean death. 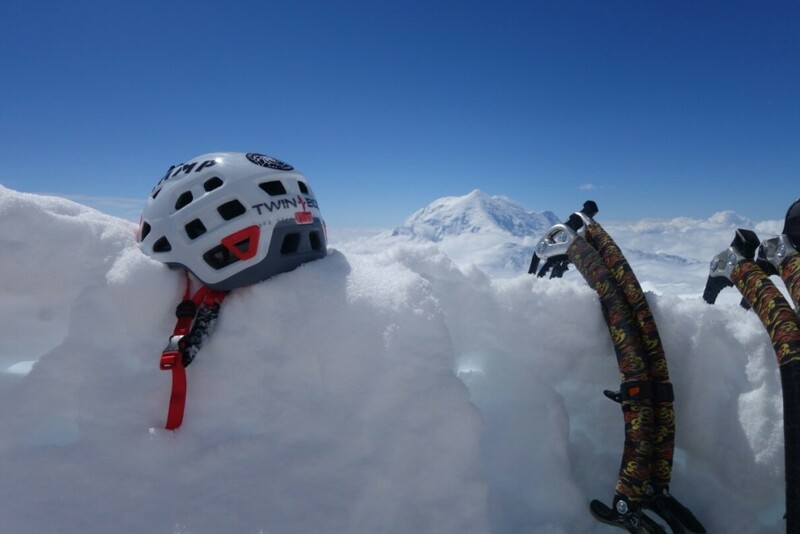 At 6000 we reached the top of Pig Hill and the last ridge of cornices to get to the summit. We left our backpacks by now void of any food and fuel and continued to the summit. Every 10 steps we had to stop to catch our breath but at 4 pm of the 23th we reached the summit after 5 days and 61 non-continuous hours of climbing. We were elated and extremely happy also exhausted so we decided to begin our descent immediately. 5 hours later we reached 14k and our tent. 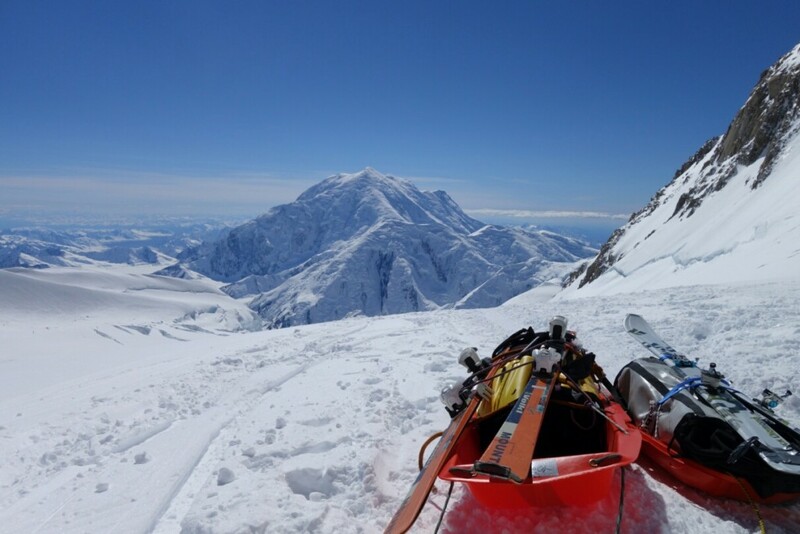 Our mission was accomplished and our first trip in the Alaska range successful beyond any expectation. 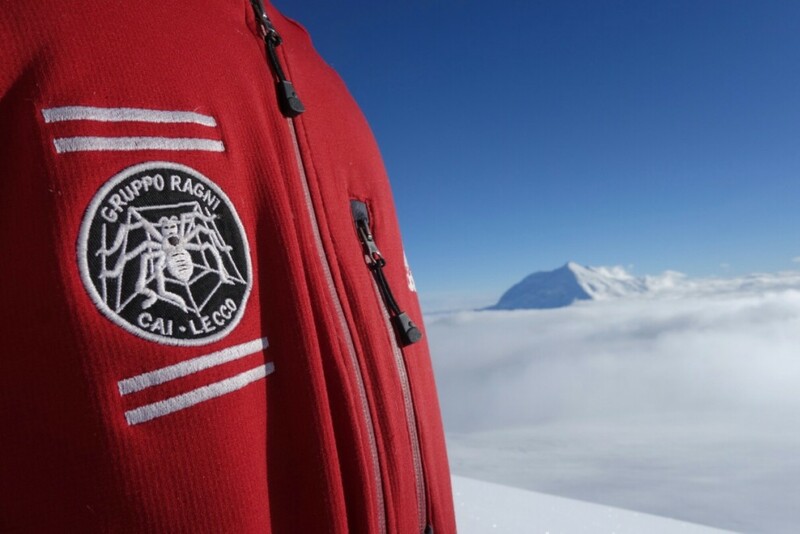 A big thanks to RAGNI DI LECCO, ADIDAS OUTDOOR, CAMP CASSIN, CAI LECCO AND CAI VARESE and all my friends, Matteo DB, Samuele Bignami, Caterina Tixi and my Family.